LAKE BOWEN WATERFRONT HOME on 1.29 ACRES WITH DOCK! 25 mins to Tryon and the Tryon International Equestrian Center, 20 mins to Foothill Equestrian Nature Center, 22 Mins to Downtown Spartanburg, 30 mins to Greenville Spartanburg International Airport, 40 mins to Greenville and 1 hour to Asheville. 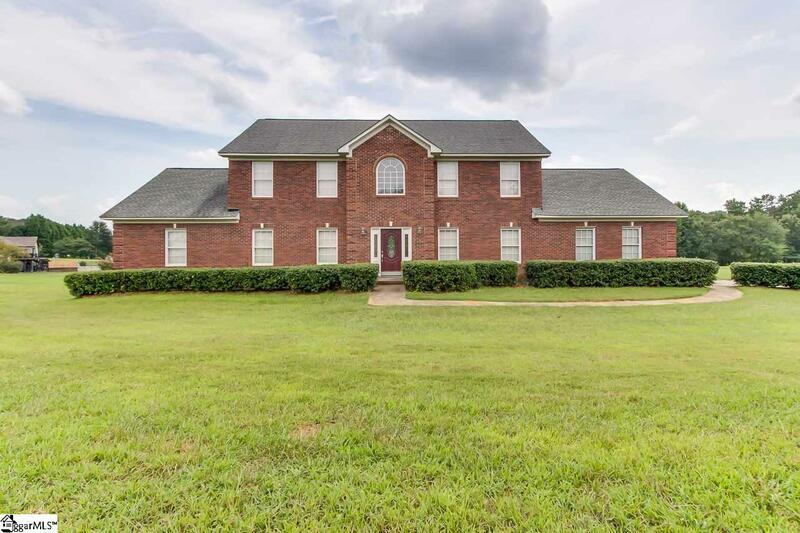 2,700+ SF All Brick home features 5 BEDROOMS 3.5 BATHS and gorgeous views of Land and Water. Solid wood front door, 2 story foyer with Chandelier, Hardwood Stepped Staircase and Wainscoting greet you in the Foyer. The Hardwoods throughout the Main Floor Living Areas and staircase were recently refinished and the home was recently painted. The Main floor has a Great Room, Dining Room/Den, Master on Main, Kitchen, Breakfast Room, Half Bath and Laundry Room. The Great Room features a Trey ceiling, Wainscoting surround, Crown moulding, Ceiling Fan and Storage Closet. The Dining room has views of Lake Bowen and the Large Lot. It also has hardwood floors, a ceiling fan and an entrance to the Kitchen. The Kitchen features Granite counter tops with Eat-In Bar, Solid Wood Cabinetry, Hardwood Floors and Stainless Steel Kitchen-Aid Appliances. Breakfast Room off of the Kitchen has sliding glass door to 10x40 deck and backyard overlooking lake. There is an entrance to the Garage through the Kitchen/Breakfast Room. The MAIN LEVEL MASTER Bedroom has a TREY ceiling, Views of the Lake, a Large Bathroom with Dual Vanities Granite Countertops, a Jetted Tub with Granite Surround, a Separate shower, Tiled floors, and a Walk In closet. There is 7x12 walk in Laundry Room to the right of the entrance Foyer with Tiled Floor and room for storage. Also to the right of Foyer is a Half Bath with granite vanity and Tile Floor. You will also find another Coat Closet off of the Laundry/Half Bath. Upstairs features 4 very large bedrooms each with a ceiling fan and A large closet. There are 2 full baths both with Granite Countertops and Tile Floors. Sit on the Deck in the cool of evening and enjoy the Lake Life. The 27x19 oversized garage has plenty of room for Lake toys! The Large Lot has plenty of room for the Lake loving Family. This home is 2 mins from Lake Bowen Landing and Anchor Park. 5 mins to Woodfin Ridge Golf Club. 7 Mins to Oakland Elementary and Boilings Springs Middle. 12 mins to Boiling Springs High School. Sellers have painted and refinished floors recently. Taxes reflected can change dependent on Owner Occupancy.